Mowgli: Oh, Baloo, I wanna stay with you. Bagheera: Oh? And just how do you think he will survive? Baloo: "How do you think he will... " What do you mean how do you think he... He's with me, ain't he? And I'll learn him all I know. Bagheera: Oh? That shouldn't take too long. Kaa: [to Mowgli] Just you wait till I get you in my coils! Bagheera: This will take brains, not brawn. Baloo: You better believe it, and I'm loaded with both. Buzzie: So what we gonna do? Flaps: I don't know. Hey, now don't start that again! Baloo: [after the girl from the man village drops her jug of water] She did that on purpose! Bagheera: You wouldn't marry a panther, would you? Baloo: I don't know. Come to think of it, no panther ever asked me. Buzzie: [Flaps and Dizzy have just saved Mowgli] He's safe now. You can let go, Baloo. Baloo: Are you kidding? There's teeth in the other end! Mowgli: Bagheera, where are we going? Bagheera: You're going back to the man-village right now. Bagheera: Oh, yes, you are. Mowgli: [grabbing a hold of a small tree by a river] I'm staying right here. Bagheera: You're going if I have to drag you every step of the way. Bagheera: [through his teeth] Let go, you! Mowgli: You let go of me! Bagheera: [furious] Oh, that does it! I've had it, man-cub! From now on, you're on your own... ALONE! Mowgli: Don't worry about me. Baloo: [Mowgli is almost at the man-village entrance] Mowgli, come back, come back! Bagheera: [encouragingly] No, go on, go on! Baloo: Beautiful! That's real jungle harmony. Mowgli: I like being a bear. Baloo: That's my boy. And you're gonna make one swell bear. Why, you even sing like one. Bagheera: Now, it's no use arguing anymore. No more talk until morning. Kaa: [laughs] He won't be here in the morning. Bagheera: [almost asleep, but soon notices Kaa about to devour Mowgli] Huh? Oh yes, he will, I... KAA! HOLD IT, KAA! Bagheera: Shere Khan is not going to allow you to grow up to become a man. Just another hunter with a gun. Mowgli: Aww, well I'll explain I'd never do a thing like that. Colonel Hathi: [Seeing Mowgli for the first time] Well, a new recruit, eh? Ha ha... uh say, what happened to your trunk? Mowgli: [Much annoyed] Hey, stop that! Colonel Hathi: [Surprised beyond belief] A mancub! This is treason! Colonel Hathi: Sabotage! I'll have no mancub in my jungle! Bagheera: [Running onto the scene] Hold it! Hold it! I can explain, Hathi. Colonel Hathi: Colonel Hathi, if you please sir. Bagheera: Oh yes. Colonel Hathi. The mancub is with me. I'm taking him to the man village. Bagheera: You have the word of Bagheera. Colonel Hathi: Good. And remember: an elephant never forgets! Monkey: A rolling bear gathers no hair! Baloo: Yeah. I guess you're right. But I still think he'd have made one swell bear. Well, come on, Baggy, buddy. Let's get back where we belong. And get with the beat. Mowgli: [angry] You told me a lie, Kaa. You said I could trust you! Kaa: It's like YOU said: you can't trust ANYONE! Monkey: It's Baloo the bear! Second Monkey: Yeah, that's him! How'd that square get in there? Colonel Hathi: [as Bagheera tries to appeal to him about searching for Mowgli] Sorry, Bagheera, fortunes of war and all that sort of thing, you know. Winifred: [walking up to Hathi] This has gone far enough! Far enough! Winifred: Now just a minute, you pompous old windbag! Colonel Hathi: Winifred, what are you doing out of ranks? Winifred: Never mind! How would you like to have our boy lost and alone in the jungle? Colonel Hathi: But Winifred, old girl, that's an entirely different matter! Colonel Hathi: [proudly] Different entirely. Winifred: That little boy is no different than our own son. Now you help find him or I'm taking over command! Colonel Hathi: What? A female leading my herd? Utterly preposterous! Junior: Pop, the man cub and I are friends. He'll get hurt if we don't find him. Please, Pop, sir, please? Colonel Hathi: [softening up a tinge] Now don't you worry, son. Your father had a plan in mind all the time. Winifred: Dear, haven't you forgotten something? Colonel Hathi: Nonsense, Winifred, old girl. An elephant never forgets. Winifred: Well, you just forgot our son! Bagheera: [to Mowgli] Now, for the last time, go to sleep! Baloo: Keep it down! You're gonna wake little buddy. He's had a big day. It was a sockeroo. You know, it ain't easy learning to be like me. Bagheera: [scoffs] A disgraceful performance! Associating with those undesirable scatterbrain apes? I hope Mowgli learned something from that experience. Baloo: [laughs] That's my boy. Shere Khan: Bravo, Bravo. An extraordinary performance. And thank you for detaining my victim. Dizzy: Let's get out of here! Shere Khan: Why should you run? Is it possible that you don't know who I am? Mowgli: I know you alright. You're Shere Khan. Shere Khan: Precisely. And you should know that everyone runs from Shere Khan. Mowgli: You don't scare me. I won't run from anyone. Bagheera: And now what's happened? Baloo: You're not gonna believe me, Bagheera, but look. Now I used the same words you did and he ran out on me! Bagheera: Well, don't just stand there! Let's separate! We've got to find him. Baloo: [going off in a different direction] Oh, boy, if anything happens to that little guy, I'll never forgive myself. I've gotta find him! Flaps: [feeling Mowgli's legs] Blimey! He's got legs like a stork, he has. Buzzie: Like a stork, yeah. But he ain't got no feathers, he ain't. Mowgli: [to Kaa] Go away! Leave me alone! Kaa: [trying to get Mowgli to look into his eyes] Let me look at you. Kaa: You don't want me to look at you? Then you look at me. Akela: [to his fellow wolves about Mowgli] Shere Khan will surely kill the boy and all who try to protect him. Now, are we all in agreement as to what must be done? Akela: Now it is my unpleasant duty to tell the boy's father. Rama? Come over here, please. Father Wolf: Yes, Akela? Akela: The Council has reached its decision. Man-cub can no longer stay with the pack. He must leave at once. Akela: I am sorry, Rama; there is no other way. Father Wolf: But... but the man-cub is... is like my own son. Surely he's entitled to the protection of the pack. Akela: But, Rama, even the strength of the pack is no match for the tiger. Father Wolf: But the boy cannot survive alone in the jungle. Bagheera: Akela, perhaps I can be of help. Bagheera: I know of a man-village where he'll be safe. Mowgli and I have taken many walks into the jungle together. I'm sure he'll go with me. Akela: So be it. Now there's no time to lose. Good luck. Mowgli: [to King Louie] What do you want me for? King Louie: Word has grabbed my royal ear... Have a banana. King Louie: ... that you want to stay in the jungle. 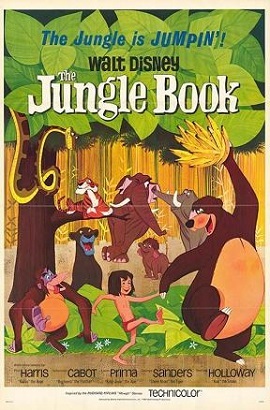 Mowgli: [his mouth full of banana] Stay in the jungle? I sure do. King Louie: ... that's me, can fix it for you. King Louie: Have two bananas. King Louie: Have we got a deal? Mowgli: I'll do anything to stay in the jungle. King Louie: Well, then, I'll lay it on the line for you. Bagheera: Well, it's happened. It took a little longer than I thought, but it's happened. Baloo: [hollering right in Bagheera's ear] BAGHEERA! Baloo: Oh, you heard me, huh? Bagheera: All right, what's happened? Where's Mowgli? Baloo: They ambushed me; thousands of 'em! Bagheera: [exasperated] Oh, for the last time, what happened to Mowgli? Bagheera: The ancient ruins? Oh, I hate to think what will happen when he meets that king of theirs. Shere Khan: Element of surprise? Ho! I say. And now for my rendez-vous with the lost man-cub. Mowgli: Gee, cousin Louie, you're doing real good. King Louie: Now here's your part of the deal, cuz. Lay the secret on me of Man's Red Fire. Mowgli: But I don't know how to make fire. King Louie: [singing] Now don't try to kid me, Man Cub / I made a deal with you / What I desire is Man's Red Fire / To make my dream come true / Now give me the secret, Man Cub / Come on, clue me what to do / Give me the power of Man's Red Flower / So I can be like you. King Louie: [singing] Now, I'm the king of the swingers, whoa / The jungle V.I.P. / I've reached the top and had to stop / And that's what's botherin' me / I wanna be a man, Man Cub / And stroll right into town / And be just like the other men / I'm tired of monkeyin' around. Mowgli: Where we goin', Baloo? Mowgli: Oh, I don't care, as long as I'm with you. Baloo: Mowgli, look, buddy, uh, there's somethin' I gotta tell ya. Mowgli: Tell me what, Baloo? Baloo: Oh, gee whiz. Now, how did ol' Baggy put it? Uh, uh, Mowgli... Ha! You wouldn't marry a panther, would you? Mowgli: Gee, I don't even know what you're talking about. Baloo: Mowgli, don't you realize that you're a human? Mowgli: I'm not any more, Baloo. I'm a bear like you. Baloo: Little buddy, look. Listen to me. Mowgli: [play fighting] Come on, Baloo. Baloo: Mowgli, stop it now. Hold still. I wanna tell you something. Now listen to me. Mowgli: What's the matter, ol' papa bear? Baloo: Look, Mowgli, I've been trying to tell ya, I've been trying all morning to tell ya. I've got to take you back to the man-village! Mowgli: But-but you said we were partners. Mowgli: You're just like... like old Bagheera! Baloo: Now just a minute! That's going too far! Buzzie: Hey, Flaps, what we gonna do? Flaps: I don't know. What you wanna do? Ziggy: You mean you wish they were. Baloo: Well, now. Ha ha! What have we here? Mowgli: [slaps Baloo in the nose] Go away! Baloo: Oh, boy! I've seen everything in these woods. Ooh, what have I run on? What a pretty thing this is. Baloo: Well, now. That's pretty big talk, little britches. Baloo: Tsk, tsk, tsk, tsk. Pitiful. Hey, kid. You need help, and ol' Baloo's gonna learn ya to fight like a bear. Baloo: [singing] When you find out you can live without it / And go along not thinking about it / I'll tell you something true / The bare necessities of life will come to you. Baloo: [singing] Now when you pick a pawpaw / Or a prickly pear/ And you prick a raw paw / Well, next time beware / Don't pick the prickly pear by the paw / When you pick a pear try to use the claw / But you don't need to use the claw / When you pick a pear of the big pawpaw / Have I given you a clue? Bagheera: Pawpaw, ha! Of all the silly gibberish. Baloo: [tugging on Bagheera's tail] C'mon, Baggy, get with the beat. Baloo: You better believe it. And you're gonna love the way they tickle. Baloo: You better believe it! Mowgli: Hello. What are you doing? Mowgli: Can I do it, too? Junior: Sure, just do what I do. But don't talk in ranks. It's against regulations. Colonel Hathi: Espirit de Corps. That's the way I earned my commission in the Majarajah's Fifth Pachyderm Brigade. Back in '88 it was. Or... or was it? Winifred: Here it comes. The Victoria Cross bit again. Colonel Hathi: It was then I received the Victoria Cross for bravery above and beyond the call of duty. Ha ha! Those were the days. Discipline! Discipline was the thing! Builds character, and all that sort of thing, you know. Kaa: ...mis-s-stake. Look me in the eye when I'm speaking to you. Kaa: Both eyes, if you please. Kaa: You have just s-s-sealed your doom. Mowgli: [to the unconscious Baloo] Baloo, get up. Oh, please get up. Mowgli: You... you don't mean... Oh, no. Baloo. Bagheera: Now, now. I know how you feel. But you must remember, Mowgli. Greater love hath no one than he who lays down his life for his friend. Bagheera: Whenever great deeds are remembered in this jungle, one name will stand above all others: our friend, Baloo the bear. Baloo: [sniffing] He's cracking me up. Baloo: I wish my mother could have heard this. Bagheera: It's best we leave now. Come along, Man Cub. Baloo: Hey, don't stop now, Baggy. You're doing great! There's more, lots more! Mowgli: [mentioning Kaa] Bagheera, he's got a knot in his tail! Kaa: [imitating Mowgli] He-he-he, he's got a knot in his tail! Kaa: Ooh! Oh, now what? I'll be right down. Yes, yes, who is it? Shere Khan: It's me. Shere Khan. I'd like a word with you, if you don't mind. Kaa: Shere Khan, what a surprise. Shere Khan: Yes, isn't it. I just dropped by. Now forgive me if I've interrupted anything. Kaa: Oh no, no, nothing at all. Shere Khan: [brandishing his claws] I thought perhaps that you were entertaining someone up there in your coils. Kaa: Coils? Someone? Oh no, I was just curling up for my siesta. Shere Khan: But you were singing to someone. Who is it, Kaa? Kaa: Ah, um, oh no, I was just singing, uh, to myself. Kaa: Yes... yes, you see I have... trouble with my sinuses. Shere Khan: What a pity! Kaa: Oh, you have no idea. It's simply terrible. I can't eat, I can't sleep, so I ssssssing myself to sleep. You know, self-hypnosis. Let me show you how it works. Shere Khan: I can't be bothered with that, I have no time for that nonesense. Kaa: Ssssssssome other time, perhaps? Shere Khan: [Scratches Kaa's nostril with his claw] Perhaps. But at the moment I'm searching for a man-cub. Shere Khan: The one who is lost. Now where do you suppose we could be? Shere Khan: That's an excellent idea. I'm sure you wouldn't mind showing me your coils, would you, Kaa? Kaa: Nothing here, and nothing in here. Shere Khan: Indeed. And now, how about the middle? Kaa: The middle? Oh, the middle. Kaa: [laughs] I-I-I assure you there's nothing in the middle. Shere Khan: Hmm, barely. Well, if you do so happen to see the man-cub, you will inform me first. Kaa: [gulps] I get the point. Cross my heart, hope to die. Shere Khan: In good show. And now I must continue my search for the helpless little lad. Kaa: Oh, who does he think he's fooling. The helpless little lass... woooo he gives me the shhhhhhivers. Kaa: Picking on that poor, little, helpless boy. Oh yes... poor, little, helpless boy. Elephants: Hut, two, three, four. Hut, two, three, four. Shere Khan: What beastly luck! Confound that ridiculous Colonel Hathi! Bagheera: Now, while you create a disturbance, I'll rescue Mowgli. Got that? Baloo: [dancing away] I'm gone, man. Solid gone. Baloo: What do they call you? Bagheera: His name is Mowgli, and I'm taking him back to the man village. Baloo: Man village? They'll ruin him. They'll make a man out of him. King Louie: Ha-ha, so you're the mancub? Crazy. Mowgli: I'm not as crazy as you are, put me down. Mowgli: [sees the girl] Look. What's that? Bagheera: Oh, it's the man-village. Mowgli: No, no. I mean that. Baloo: Forget about those, they ain't nothing but trouble. Mowgli: Just a minute. I've never seen one before. Baloo: So you've seen one. So let's go. Mowgli: I'll be right back. I want a better look. Baloo: Mowgli, wait a minute. Bagheera: Oh, Baloo. Let him have a better look. Buzzie: [to Flaps] Okay, so what we gonna do? Flaps: I don't know, what you wanna do? Buzzie: Look, Flaps, first I say, "What we gonna do?" Then you say, "I don't know, what you wanna do?" Then I say, "What we gonna do?" You say, "What you wanna do?" "What we gonna do?" "What you want..." Let's do SOMETHING! Flaps: Okay. What you wanna do? Buzzie: Oh, blimey! There you go again. The same notes again! Ziggy: I've got it! This time, I've really got it! Buzzie: Now you've got it. So what we gonna do? Baloo: Ha-Ha! Man that's what I call a swinging party. Bagheera: Oh no! It's Baloo, that shiftless, two bit, jungle bum. Bagheera: Baloo, birds of a feather should flock together. You wouldn't marry a panther now, would you? Baloo: Come to think of it, no panther has ever asked me. Ha-ha. Bagheera: Yes, like you did when the monkeys kidnapped him, huh? Bagheera: Not in the jungle! And another thing, sooner or later Mowgli will meet Shere Khan. Baloo: But little Mowgli don't have those things. Bagheera: Shere Khan won't wait until he does. He'll get Mowgli while he's young and helpless. Just one swipe! Baloo: Oh! Well, what... what are we going to do? Bagheera: Do what's best for the boy. Baloo: You better believe it! You name it, I'll do it. Bagheera: Good. Then make Mowgli go to the man-village. Baloo: Are you out of your mind? I promised him that he could stay here in the jungle with me. Bagheera: Well, that's just the point! As long as he remains with you, he's in danger! So, it's up to you. Bagheera: B-because he won't listen to me. Baloo: But I love that kid. Baloo: I love him like he was my own cub! Bagheera: Then think what's best for Mowgli, and not yourself. Baloo: Well... well, can't... well, can't I wait until morning? Bagheera: It's morning now. Go one Baloo.